The situation of BIOS cannot boot is PC can be turned on but BIOS cannot boot correctly, so PC itself does not work consequently. It is different from PC cannot boot since various parts cannot be turned on such as power supply or internal hard drive etc. That's why, to fulfill the following conditions. Power indicator lights, cooling fans of CPU and power supply are rotating. Hard drive access lamp lights at first, but later it's completely off. Display is black, nothing shows and no beep. Because of no signal sent to display unless BIOS boots, the display should black and of course BIOS does not beep. If you can hear beep, it from BIOS and tell you the problem about DRAM or videocard etc... have some troubles by it instead of cannot show at display. Conversely, it is very likely that BIOS cannot boot yet in case of applying above contents. Even BIOS cannot boot, usually suspect motherboard trouble and probably there's nothing that can be done at first sight, but in fact you can check some points. BIOS stands for "Basic Input Output System". That is literally take on a basic input and output program. Especially in case of PC, if BIOS of motherboard cannot boot, the action will be ceased due to the incapability of operations such as reading the hard drive. BIOS is like base of PC system, so if BIOS cannot boot, the PC equal to not be able to use. When BIOS is booting, it reads the information preserved in CMOS at first then tries to boot the PC by following the configuration. But sometimes it cannot read out the information in CMOS, then BIOS cannot boot too. The main cause of being not able to read out the information in CMOS is deterioration of the button battery for back up the CMOS. So, in case of BIOS cannot boot, the most suspect place is the button battery for back up the CMOS. The voltage depression of the battery does not become zero at once. For example, a rated 3V CR2032 ups and downs around 2-3V and voltage reductions by slow. It may still have electromotive force as the battery but when it not be able to keep electromotive force for back up the CMOS, appears as the symptom of BIOS cannot boot. The life of the button battery for back up the CMOS, that depends and in my experiences, it would probably think about dead battery if it have been when 5 years from PC purchase. Conversely, a little old PC cannot boot BIOS, I recommend you to change the button battery for back up the CMOS at first. Especially in case of BIOS sometimes can boot or sometimes not, the problem might be deterioration of the button battery for back up the CMOS. When you replace the battery, please be careful not to blur into new one and old one because if it does not work as for back up the CMOS, it has little electromotive force yet. Sometimes not discern to be measured in the tester. 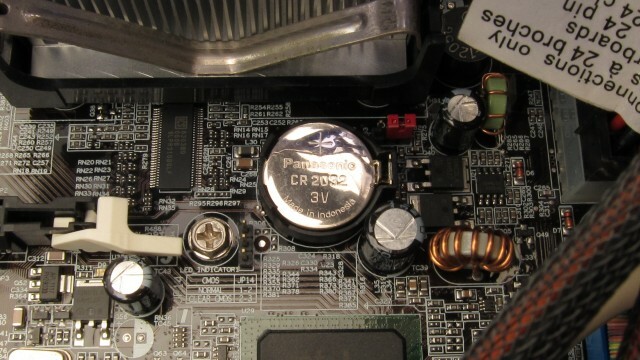 The button battery, especially desktop computers are often used CR2032 that you can get easily at stores and can get for more informations from the motherboard of PC. Because the battery holder shoud be assembled at motherboard and attached the button battery in it. For the rest, you replace the battery in a normal way. With using the fine-tipped slotted screwdriver, it going to be more easily. In case of laptops, it going to be a little more difficult as make a replacement of button battery for general-purpose item. As a reason, it does not have battery holder because of space constraints and often soldering the terminal direct to the electrodes of the button battery. Though you replace the battery, need to replace as a battery unit. It may treat as a repair depending on the product. Even if BIOS cannot boot, it looks difficult to do anything but the case that it will become normal operation just replacing the button battery is often. I think it is worth replacing the battery only few dollars if your PC will become normal operation.